Want to reach more people and provide more value in a more time-efficient way? James welcomes back the PE Geek Jarrod Robinson for a 3-part series, to share and discuss the main marketing strategy of his business: automated webinars. 06:19 – Why not just a video link? James: James Schramko here. Welcome to SuperFastBusiness.com. Today, I have a special guest on the line. Welcome, Jarrod Robinson. Jarrod: Hey, James! Thanks for having me again. This 3-part series is going to take our readers and listeners on an adventure. We’re going to start with part 1, which we’ll cover today. We’re going to be talking about why you might consider automated webinars, what’s the best practice, how you actually prepare them. That will set us up for part 2, which is where we’ll be covering the traffic and things like the ad creative and what sort of things you need to put on the pages and how you might stay in touch with people who register for the webinars. And then part three will be how we get the best out of it, how we automate it, we’ll talk about topics like the chat and follow-up emails and what we can customize. So are you ready to set off on this automated webinar adventure, Jarrod? James: Fantastic. Now just for a little bit of context Jarrod, you are the world’s most famous and only PE geek. Jarrod: Absolutely. Yeah. I couldn’t have said it better myself. So I’ve been running a website for teachers. The nice tie-in between the SuperFastBusiness Live presentation and these automated webinars is basically around the fact that this is really relevant to my audience. I’m doing the thing that actually, really matters. I got rid of all the things in my business that were irrelevant. That’s what the talk was about. One of the things that I sort of discovered that was really working was these automated webinars. I’m super excited to explaining how they work for me. James: I think the important point there is that this works in a non-Internet market-ey niche, such as with teachers. That’s an important distinction. Someone might be listening to this thinking, what about James? Is he using them? Well I’m currently setting them up with your help, Jarrod. This series is kind of almost a self-serving checklist of the things that we’ve been doing and what we’re about to do. So someone visiting SuperFastBusiness in the future might find themselves seeing this in action. But for now, you’ve been doing this for how long? Jarrod: Probably around about 18 months. At the time, it was just more because I felt that was the only way I could deliver the content with so many other things on. And then when I started to realize that I had more time, it was one of these things that I looked to sort of amplify and release as often as I possibly could. I mean I think one really important distinction to make so that everyone is clear is that when we’re talking about automated webinars, we’re not talking about trying to be live or faking it so that people think that you’re live. I know that you’re a big advocate for not trying to do that. James: Well I was invited to record a webinar with someone, a marketer, and they sent me over the scheduler, and they said, “We need to schedule you to make the recording for our fake live webinar.” I replied back and said, “Well, I don’t do fake anything.” So let’s just be clear. I’m happy to do it but we have to reference it as something that is not indicating that it’s currently live. So it shouldn’t be fake. I think you can definitely frame it in a nice way without it having to pretend to be something that it’s not. You could easily call it an online training seminar, especially the less Internet market-ey niche that you have, the easier it will be to really dazzle someone with the availability of being able to schedule training. It could be just schedule your next training session or an online training session. 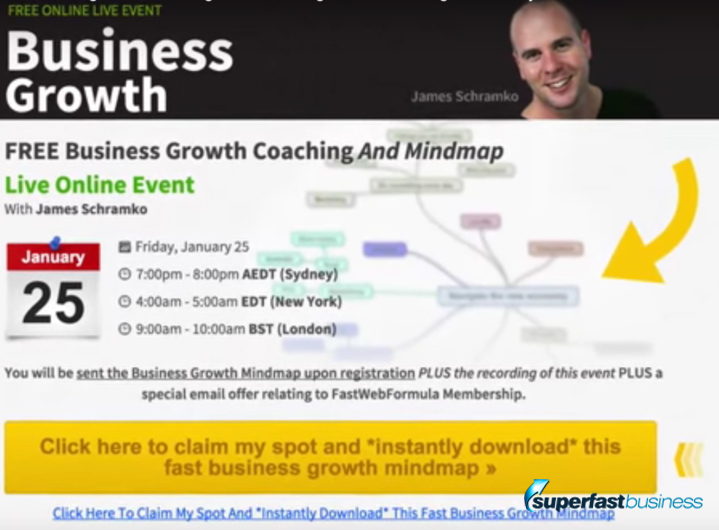 The highest converting webinar template, registration template that I ever had for my live webinars, I didn’t even use the word webinar, I called it live online training. So you could just drop the word live and you could say schedule the next session of our online training. Jarrod: Yeah, absolutely. Like I think this neutral wording is really quite profound. So in all of my communication to the audience, and we’ll get into exactly what I do with that later on, but it’s just very neutral. I try and ensure that when I’m doing the actual recording, that there’s no sort of words that might make it seem like I’m trying to pretend to be live. I call it an on-demand training. People get the benefit of being able to access it at a time that suits them. That’s the real benefit here, and for me, it’s just leveraging my time so that I can be more helpful. James: I really like that word, on-demand. That’s a great word. Jarrod: Yeah, I think that sums it up. James: Have you ever had any complaints? Jarrod: No. I mean I don’t. And again, I am in a niche where people probably aren’t as savvy. I think a lot of them actually believe I am there live, even though we don’t ever communicate. We have had one person say and actually apologize because they couldn’t make it, which I thought was quite interesting. So no, we don’t get any apologies. We usually just get massive applause for delivering high value to people at a time that suits them. It sort of comes back to how I perceive this automated webinars as well as being really actionable and really powerful for the audience. I was thinking I’d be asked the question about why wouldn’t you just send someone a video as opposed to making them go through this registration process. I actually compared this with two segments of my audience. I’ve got the exact, same media file that I recorded and delivered through just a video link to my members. So these are people that have paid for the content and they’re getting it. I delivered the exact same thing through an automated webinar. I mean what do you reckon the statistics were regarding that? James: Well I suspect that the online training that you’ve automated is going to be better because of the deadline aspect and the event aspect. Jarrod: For sure. Yeah. So this is just one of the webinars. We had a show-up rate of about 60%. So there are people that had registered and turned up, about 60%. Of those people, 94% of the people stayed the entire hour to watch the entire thing. But if you compare that with the people who just got sent the video link, we had an engagement of 23%. So only 23% of the people saw the entire thing. To me, if I think that I’m trying to be helpful, then I need to pick the medium, which makes that possible. James: I think that’s a great result. I’m wondering if you’ve compared it to having live training and what some of the advantages of automating might be. I could think of one, well actually two. One I would guess is that you don’t have to turn up. I think that’s a significant one, unless you’re using some of the advanced techniques that we’ll cover in our third part of this series. And the other one is that you could probably get the very best live one that you’ve ever done and use that one as your automated one so that you’re starting with a known high-converting training and it’s more consistent. Jarrod: Absolutely, yeah. I mean I think with any model, you’re going to have some given, some taken, pluses and some minuses. But for me, the automated webinar seems to tick all the boxes. It means that I can be more leveraged. I have seven different automated webinars that are running at any one time. They all serve as funnels into my core membership product. So I know that if I tried to do that live, I wouldn’t be able to commit to the amount of sessions that I have. I mean each of those webinars is running at least six times a week. They’re just automatically providing value to people and flowing into members. So it’s this really beautiful process that’s sort of taking place. As a matter of fact, a member just signed up right now as I say this to you, and that’s because of the automated webinars. James: Jarrod, I hope you’re not multitasking. Jarrod: I just noticed the notification. James: That’s OK. Look, I think going back to one of your previous points too, where some people might feel that it’s live. I think even a good movie where you go and watch at the cinema will actually be believable and bring you into the movie, and you probably feel that you are in that moment in time. So I don’t think that’s a bad thing. I think that’s a positive sign that you are capturing attention and you are moving people. I love that you said you’ve got seven running at once. It would be physically impossible to do that, and I think in much the same way as having a website is a tremendous marketing tool. We hear often of a website being a 24-hour a day, 7-day a week salesperson. This automated webinar is just the next extension of that. Jarrod: Yeah absolutely. I think another thing that I’m always thinking about, you could probably get slightly better result with live but then you don’t have as much frequency so you don’t get to touch as many people and impact them. But I often think that a lot of people doing webinars don’t need necessarily do the live as best as they possibly could. If you think of the model of a webinar that someone might run, they’ve got 5 minutes of chit chat at the start where they’re talking with people and then they launch into this 40-minute segment, which is, it could very well be recorded, if you know what I mean. This is sort of one way. That’s what I’m sort of mindful of, you know, that I’m getting a result and I’m not having to sacrifice the time. So it’s sort of like a balance. James: So we’ve covered a little bit about why. I’m interested in what sort of results have you got, having this element to your business. What does it actually mean to you? You talked about show-up rates and watching, so we know already that a) these things are happening when you don’t have to be there; and b) you’re able to actually have more of them than you could do by yourself. We also know that you are able to have a little bit more consistency with what you’re showing people. But what does it actually mean to your business in other result terms? Jarrod: Well, this is the only way that I sell memberships to my community now. So I can directly relate the automated webinars to people who then go into the membership community on a recurring basis. And we have been heavily invested in creating one of these a month, the last 4 months, and in that exact same process we’ve taken our membership community from zero to over 160 people who are now paying a recurring subscription, and that’s all come down to this automated webinar delivery that then at the end has a subtle pitch and then sort of takes people through an automation of emails that hopefully get them into the community. James: OK, so we’ve covered a little bit about why you might be interested. We’ve talked a little bit about what it is, but we probably have to get a little more technical here. Let’s talk about what the best practice is for making a webinar, such as, are you taking a live one and repurposing that, are you just creating a webinar that you record all by yourself, and what tools are you using and how do you actually get them up to the Internet? We probably need to finish all of these things to complete this module here. Jarrod: Excellent. So, I mean the first part is you want to decide on a topic, and I think that’s an important part for this automated webinar round, because maybe some topics might have more audience question and feedback, and maybe they’re not quite as suited to the automated fashion. But I tend to pick a topic that can be really be helpful to people whether they’ve got the chance to ask questions or not. And I often look at my support tickets and my emails for ideas to come up with those sort of webinar topics. I know that you’re fond of that as well. And then, I would sit down and literally storyboard out the webinar. So not taking one that I’ve done before, but building one specifically for the automated delivery, and once I’ve created the webinar topics and I’ve identified where the webinar’s going to go. I apply the same template to all of my slides, and I do this for all webinars, because I find that it makes it so much easier to get going rather than having to pick fonts and all that. I just use the same templated design all the time, and I know you do the same thing, James, with your stuff as well. Jarrod: Yeah, it really does help with getting the content produced. And once I’ve got it made, then it’s time to record it, so it’s Camtasia, or ScreenFlow if you’re on a Mac, and I sit down with a good microphone, and I record it in short batches, and literally that means I’ll record 10 minutes of the presentation and stop and go and have a break, and come back and then record the next 10 minutes. And I find that that helps me reset, it helps me make the connections between major topics a bit clearer and better and you’re not trying to speak for 60 minutes where you get fatigued. And I find that those short batches allow me to come out with a better result. James: Yeah, fantastic. So you’re thinking about a topic that is reoccurring in your helpdesk, so you’re finding something that really impacts your audience, that’s tailor-made for them. You use a framework to structure the content in a way that… I mean, as a teacher, you got a bit of an advantage to this. You can actually come up with usable training things. And I’m sure as a teacher, you must see some of the trollop that’s out there on the online world and laugh at it, how ineffective it must be structured. Jarrod: Oh, without a doubt. It’s a bit of a pet hate. And you know, there’s so many people doing amazing things with it, whether they’re teachers or not. But I can’t help but look at it with that sort of frame in mind, so you know, when I piece together a training video such as this, it’s definitely using a lot of the skills that I’ve built across the course of my time teaching in a classroom with what I believe to be the most difficult crowd, teenagers. And yeah, I definitely have the end in mind, as a teacher would, with what they are going to achieve, and sit down and record it, and make the absolute best possible thing that I could do. And I reckon that’s a hidden benefit. You know, if you do a live training, there’s going to be mistakes, and there’s going to be bits and pieces that maybe didn’t work quite as well. I get the benefit of knowing that I can deliver the best content, and I think that’s a really powerful thing to get across. James: So you typically record it just by yourself? Jarrod: Yeah. I sit down and connect it in, and have to do retakes sometimes if I make a little mistake, and that didn’t sound right, and set it up, and then eventually you’ve got this nice MP4 recording which you can then upload to your host. James: So just to break that down a bit, are you using PowerPoint or Keynote? Jarrod: Keynote, so I put them into the 16 x 9 format, I know that you’re a big fan of that as well. James: I love that. Any time I see the old, square 4 x 3, I think they’re just like stuck in the ‘90s. So we start with the end in mind, we build a Keynote that illustrates the result we’re trying to get, we put together a design, a pathway to get there, with some good education, you said something before about a soft pitch, I imagine you’re asking them to take an action somewhere in the webinar? Jarrod: Yeah. So I’m constantly trying to help them as much as I can, but also trying to sow that seed that there’s more help if they take up the membership option. So throughout the webinar, there’s constant reminders of what they could get if they were a member. You know, this could be a resource that they could get access to, and it would make their job a bit quicker, etc., to get to the result. And then right at the end, I also do a bit more of a harder pitch, where I talk through the features of the membership, and how they can take it further. And that’s the 60-minutes of the webinar with the major content and about 5 minutes major pitch at the end. James: Right. So you’re basically giving them an apple on the way through. James: And you’re indicating they could become a member of the orchard and continuously harvest apples as long as they want. And you put that into a slide show, you record that with some screen capture software, something like Camtasia or ScreenFlow. And then you end up with an exported file that you upload to where? Jarrod: Amazon S3 is the space that I’ve found best, reliable for hosting the video files. It’s cheap, you only get billed based on the amount of traffic that gets sent, and it’s really quite affordable. But you can also use something like Vimeo or Wistia. I’ve just found Amazon S3 to be a really great way to deliver that content through the particular software I use for automated webinars. James: Right. I didn’t know you could use Wistia, in which case I would probably lean that way, because I know they multi-encode for different devices. James: And when you put them into Amazon S3, I guess you’re just selecting one encoding rate, which may not suit everyone. James: Good to know. Now what webinar software are you talking about? Jarrod: I’m talking about EverWebinar software for doing automated webinars. It’s a pretty new addition to the space. I should mention that I actually have used about three of the other tools as well, in testing them to find the right purpose. And I always do that, I’m always looking at the new tools, and if I find that something meets my needs more so, then I’m not loyal, I will move across to the better tool. And at the moment, that’s EverWebinar, and it’s serving me really well. Really quick to set up, really easy to build what you want, and good analysis of what people are doing in your webinar. James: Nice. OK. And I’ve recently got that at your recommendation, and we’re using that to build my automated webinars. So that’s good to know. Now what do we need to cover in this episode to finish out? We’ve talked about why automated webinars are good, we’ve talked about what it actually is, it’s an online training that someone can go and look at at a schedule that you choose. We’ve talked about how leveraged it is for you and what’s working for you, what sort of results you’ve got, actual tangible 160 members, that’s pretty impressive. We’ve talked about how to build out your slides, how to record them and how to upload them. I think we’re getting close to moving onto the next part of our series, where we’re going to talk about all the good stuff, like how we actually create the landing page and drive traffic to this. Jarrod: Yeah, Absolutely, we’re set. James: So I’ll see you on the next episode, Jarrod, thank you so much for generously sharing this information. Jarrod: Yeah, look forward to it. James: If you want to find out more about Jarrod, he’s got a website called workwithjarrod.com, and I’m always inspired by what Jarrod does. He’s a super innovator, very tech-savvy, he’s of a generation that really gets this stuff, and that’s why I’ve invited Jarrod to share this, because he’s actually doing it and getting results. So that’s workwithjarrod.com. We are coming up with our next episode, Part 2 of this How To Use Automated Webinars In Your Marketing series. We’ll see you on the next one. Access more powerful business strategies inside SuperFastBusiness membership. Great first show. Problem we’re having with Everwebinar is they don’t allow you to have your own thank you page which is annoying if you want to use that page to extend your funnel offer. We’re creating a workaround. “At the moment, there is only the version they give you which is not really a thankyou page but a confirmation of booking with downloadable calendar links etc. Re: Thank you page: You can add a video and a link to their thank you page but it’s very rigid right now and is probably fixed this way to promote their product Webinarjam as it’s branded. Not great if you want to utilise the thank you page as a way to continue the registrants adventure before the webinar (in a customised way). Re: Syncsumo. That’s great for remarking on Facebook but we’re having issues with Everwebinar – Ontraport integration. As far as we know, Everwebinar has no option to pass the time/date of the webinar to Ontraport (just name & email) and so you’re forced to rely on their system to send time or event related emails if you want to use automation. This is bad if you have a sophisticated funnel, related closely to the event details, on the backend. They should definitely remove the band plug. Correct – they have not completed deep integration for ontraport yet, they have for IS & AC. Mine follow up funnel is action based and works like a dream.